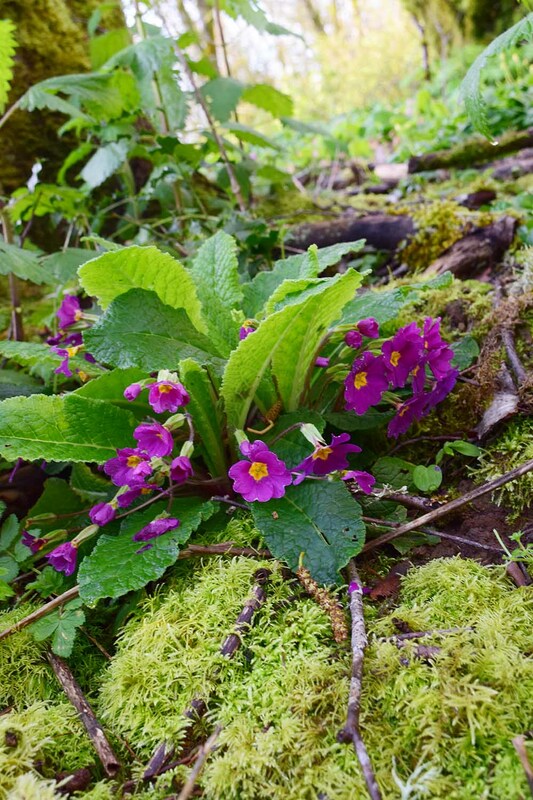 A primrose is a humble flower, perhaps you might not even miss it if it disappeared from your garden. Yet what if you found one blooming in the wild woods—far from garden or nursery? What if you knew this wasn’t a native plant struggling against the stinging nettle and encroaching blackberry? What if you suspected that the distinct perfect pink blossoms belonged to a famous strain of primroses developed decades ago in Gresham, Oregon? By the end of 1966 all the primroses on the Barnhaven estate were gone from American soil. Florence Bellis, the concert pianist turned amateur botanist had sold every plant down to the last leaf. Wanting to keep her progeny from the clutches of commercial nurseries she sent them packing back to England from where the first humble seeds had arrived. The primroses had begun their American lives back in the Great Depression in the small town of Gresham, Oregon where Florence had turned 5 dollars worth of seeds into a startling new strain of plants. By throwing herself into research and using a unique hand-pollinating technique the self-taught botanist developed a strain of bi-colored, richly hued, hardy plants. They would be named for the place of refuge she had called home—Barnhaven. As fame and demand for the plants grew, the former small farm was transformed into a primrose nursery where buyers could select plants from lush beds to have them dug up and potted if they couldn’t wait for the latest seed inventory. The plants might have been enough in and of themselves, but Florence did them one more service. Her enthusiasm for describing the varieties in her seed catalogs eventually led to the founding of the American Primrose Society and so at least ensured some historical continuity for her work. However, decades of primrose fame did not translate into to the sort of financial success that was enough to sustain her. After all, even in their most delightful bloom the primroses were too humble a plant to compete with the glamour of a rose or the notoriety of an orchid. So when her second husband died Florence shipped off the entire Barnhaven seed stock to former customers in England. Years later Florence chronicled much of her efforts in a book, Gardening and Beyond. It seemed that that was the end of these inspirational little posies on American soil except as in reflection. If you were one of the rare Barnhaven primrose hunters you had get them from France, as even the English couldn’t maintain an interest. And then there was an unexpected discovery. One freezing cold January morning I was following the coyotes’ trails through the woods on Gresham Butte when I happened across a patch of peculiar shaped leaves and, knowing of the local history, had raised hopes. I returned week after week—for I only lived less then a few hundred feet away on the old Barnhaven property. One sun-speckled morning the blooms burst open and revealed themselves as non-other than the eponymous primroses. Were these errant garden escapes so hardy that they had survived all these decades untended or had they been deliberately left behind? I turned back to Florence’s book and reread this, “…When I first saw the loveliness of these Candy Pinks—frosted confections blooming under a sheet of ice in an alder grove next to beds of purest blues—I stood before them crying, the beauty too much to bear.” (p. 149) Later in the fall I would come back to find the tough little primroses still blooming and noted that they were indeed planted between some alder trees. Looking up past the horrid tangle of threatening blackberry bushes I could see bright red apples on trees that had grown to over 100 feet in competition with the Douglas fir and alder. On page 145 of her book is a depiction of the orchard on the hill. The orchard is being subsumed by the forest and perhaps one day the blackberry bushes will eventually crowd out the remaining Barnhaven primroses. Standing in the spot where Florence must have stood crying over the struggle and the joy of producing those earliest blooms I too was overcome. These weren’t merely garden escapes. Florence had left them behind to become naturalized residents. Careful to leave a legacy amount in the woods at the edge of the old “orchard”, I lifted a few and brought them back down to Barnhaven proper where they have since proved themselves to be the most hardy, cheerful and storied flowers one could imagine.